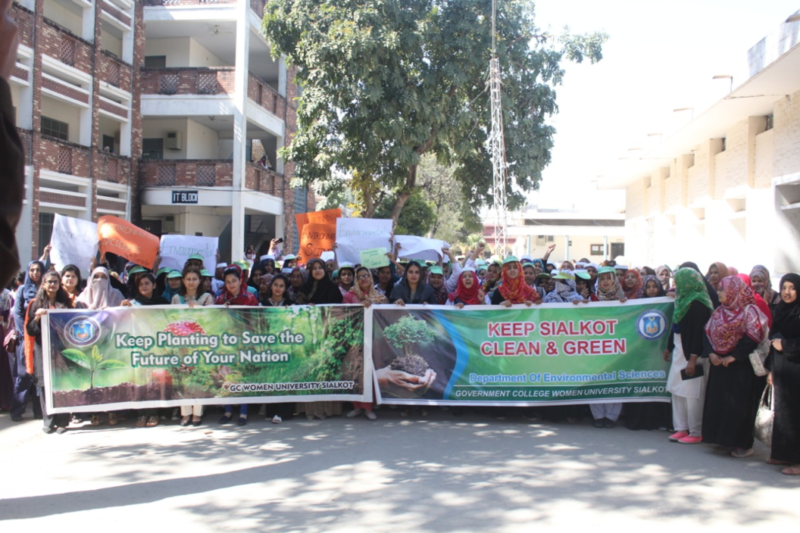 Dean Faculty of Natural Sciences Govt College Women University (GCWU) Sialkot organized an awareness walk on 22nd March 2019 to promote Prime Minister Imran Khan’s concept of a clean and green Pakistan. Addressing the occasion, Vice Chancellor Prof. Dr Hafiz Khail Ur Rehman said that being Muslim, cleanliness is “our religious obligation which ensures a healthy environment in the society. Further he said, Just as our lungs absorb carbon dioxide from the blood and infuse it with oxygen, green plants absorb carbon dioxide during photosynthesis and release oxygen into the atmosphere. The earth’s forests and plants act as Earth’s air purifiers, soaking up the large amounts of carbon dioxide absorbed. Making Pakistan clean and green is the prime responsibility of every individual”. At the end he said I hoped that the students and community will continue clean and green Pakistan’s campaign as a regular feature.